Again, another moment of joy has come the way of Nigeria's first female Majority Leader at the House of Representatives in the 7th Assembly, Hon Mulikat Akande-Adeola, as she celebrates her 53rd birthday anniversary. Impressively, all progressive elements both in public and private sectors are proud to be such an important part of her legacy in our body politic. Hon. Mulikat is from Oyo State, and represents Ogbomosho North, South/Orire Federal Constituency at the National Assembly. She was born in November 11, 1960. 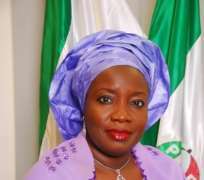 The affable legislator completed her Law programme at Ahmadu Bello University, Zaria in 1982, and was called to bar at the Nigerian Law School, Lagos in 1983. She later proceeded to the prestigious University of Lagos for her second degree in Law (Masters of Law) and successfully accomplished her mission in 1985. Before she delved into active politics and also as member of the 6th Assembly in 2007, she had established for herself a meritorious and indelible employment history. She started her mandatory NYSC programme in 1983 and finished in1984 in the Legal department of the Nigeria – American Merchant Bank. Hon Mulikat equally had a part-time employment with Kusamotu, Olojo & Co., as Associate (1984 – 1985). From 1986 to 1987 she was Associate in firm of Odunjurin & Adefulu. She later worked as Company Secretary/Legal Officer at Tuns Farms & Agro Ind. Ltd, Ikeja (Aug – Nov. 1987). Her private practice however began in Jan. to Sept. 1988. She further added to her feather the post of Assistant Manager (Legal Dept.) Continental Merchant Bank Nig. Ltd (Sept. 1988 – March 1991). Her enviable profile did not end there as she was made a Legal Adviser, Corporate Banking Division Continental Merchant Bank Nig. Ltd. (March 1999 – Dec. 1992) and later, Head of Legal/Administration CMB Home Ltd Appointed Company Secretary/Legal Adviser CMB Homes Ltd (Jul. 1993 – Feb. 1996). After recording several milestones in the corporate world, she returned back to Private Legal Practice (Managing Partner) M.L. Akande & Co. (1997 – May 2007). However, the impactful participation of Hon Mulikat in today's politics especially the aspect of her intimidating track records as a federal parliamentarian has positively raised the stakes for women to get engaged in our political affairs. Although our political terrain perhaps doesn't make the involvement of Nigerian women into elective positions come easy. More often women do not receive the support and mentoring they need to compete with their male counterparts. In turn, many voters do not fully appreciate the benefits of having a mix of men and women in government. As a result, there is currently a low representation of women at all levels of government in Nigeria. In the country's general election in 2011, female candidates fared poorly, with only 32 women elected to the national parliament out of 469 members, which is barely 8% representation. It is indeed gratifying to note that Hon Mulikat has steadfastly and irrepressibly demonstrated unwavering support for Nigeria's democracy and willingness to readily avail our dear nation of her time and wise counsel whenever occasion has demanded at the hallowed chamber and elsewhere. Our astute, dynamic and cerebral leader, I join your family, colleagues, members of staff, numerous friends and many well-wishers to thank Almighty God for His continued guidance, protection and provision for you in the past fifty-three years of a life of outstanding accomplishments, I wish you a very happy birthday and many more years of good health and personal fulfillment. May God bless and prosper Nigeria.